Brunswick Records is an American record label founded in 1916. Records under the Brunswick label were first produced by the Brunswick-Balke-Collender Company, a company based in Dubuque, Iowa which had been manufacturing products ranging from pianos to sporting equipment since 1845. The company first began producing phonographs in 1916, then began marketing their own line of records as an after-thought. These first Brunswick records used the vertical cut system like Edison Disc Records, and were not sold in large numbers. They were recorded in the US but sold only in Canada. In January 1920, a new line of Brunswick Records was introduced in the US and Canada that employed the lateral cut system which was becoming the default cut for 78 discs. Brunswick started its standard popular series at 2000 and ended up in 1940 at 8517. However, when the series reached 4999, they skipped over the previous allocated 5000's and continued at 6000. Also, when they reached 6999, they continued at 7301 (because the early 7000's had been previously allocated as their Race series). The parent company marketed them extensively, and within a few years Brunswick became one of the USA's Big Three record companies, along with Victor and Columbia Records. The Brunswick line of home phonographs were commercially successful. Brunswick had a hit with their Ultona phonograph capable of playing Edison Disc Records, Pathé disc records, and standard lateral 78s. In late 1924, Brunswick acquired the Vocalion Records label. A Brunswick record label from the mid-1920s. 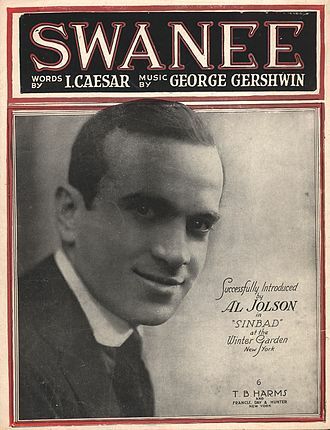 Once Brunswick's engineers had tentative control of their new equipment, the company expanded its popular music recording activities, exploiting its roster of stars: the dance bands of Bob Haring, Isham Jones, Ben Bernie, Abe Lyman, Earl Burtnett, and banjoist Harry Reser and his various ensembles (especially the Six Jumping Jacks), and Al Jolson (whose record labels proclaimed him "The World's Greatest Entertainer With Orchestra"). 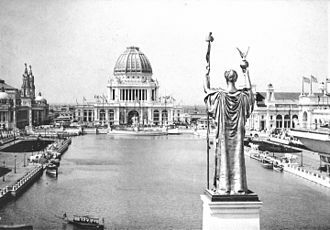 Then based in Chicago (although they maintained an office and studio in New York), many of the city's best orchestras and performers recorded for Brunswick. 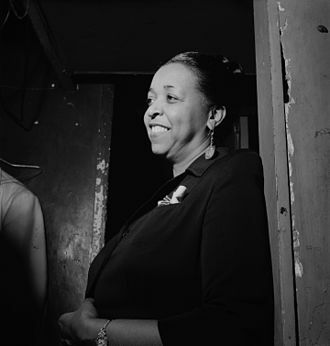 The label's jazz roster included Fletcher Henderson, Duke Ellington (usually as the Jungle Band), King Oliver, Johnny Dodds, Andy Kirk, Roger Wolfe Kahn, and Red Nichols. Brunswick initiated a 7000 race series (with the distinctive 'lighting bolt' label design, also used for their popular 100 hillbilly series) as well as the Vocalion 1000 race series. These race records series recorded hot jazz, urban and rural blues, and gospel. Brunswick also had a very successful business supplying radio with sponsored transcriptions of popular music, comedy and personalities. 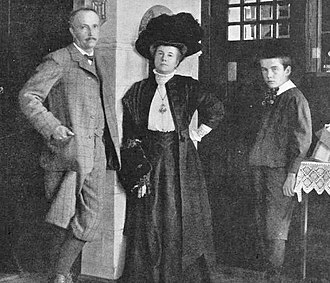 Brunswick embarked on an ambitious domestic classical recording program, recording the New York String Quartet, the Cleveland Orchestra under Nikolai Sokoloff (who had been recording acoustically for Brunswick since 1924), and in a tremendous steal from Victor, the New York Philharmonic with conductors Willem Mengelberg and Arturo Toscanini. The popular records, which used small performing groups, were difficult to make with the photoelectric cell process; symphony orchestra recording, however, exacerbated the problems of the "light-ray" system. Few orchestra records were approved for issue and those that did appear on the market often combined excellent performances with execrable sound. Brunswick found it expedient and ultimately cheaper to contract with European companies (whose electrical recording systems were more reliable than Brunswick's) to fill their electrical classical catalogue. 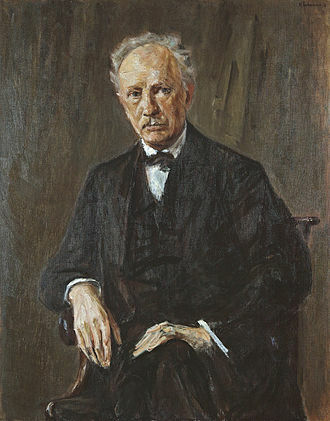 Among the recordings Brunswick imported and issued under their own label were historic performances conducted by Hans Pfitzner and Richard Strauss—the latter conducting critically acclaimed performances of his symphonic poems Don Juan and Till Eulenspiegel's Merry Pranks, recorded in Berlin in 1929–30 by Deutsche Grammophon. Some of these recordings have been reissued on CD. Brunswick itself switched to a more conventional microphone recording process in 1927, with better results. Prior to this, however, they had introduced the Brunswick Panatrope. This phonograph met with critical acclaim, and composer Ottorino Respighi selected the Brunswick Panatrope to play a recording of bird songs in his composition The Pines of Rome. Jack Kapp became the record company executive of Brunswick in 1930. In April 1930, Brunswick-Balke-Collender sold Brunswick Records to Warner Bros., and the company's headquarters moved to New York. Warner Bros. hoped to make their own soundtrack recordings for their sound-on-disc Vitaphone system. A number of interesting recordings were made by actors during this period, featuring songs from musical films. Actors who made recordings included Noah Beery, Charles King, and J. Harold Murray. During this Warner Brothers period Brunswick signed Bing Crosby, who was to become their biggest recording star, as well as the Mills Brothers, Adelaide Hall, the Boswell Sisters, Cab Calloway, the Casa Loma Orchestra and Ozzie Nelson. In November 1930 the new budget-line, Melotone, debuted, entering a field of lower-priced electrical records, including Columbia's Clarion, Velvet Tone, Harmony and the labels of the Plaza Music Company, such as Perfect, Banner, and Romeo. Melotone releases before the ARC takeover of December 1931 are not duplicated on these labels. When Vitaphone was abandoned in favor of sound-on-film systems—and record industry sales plummeted due to the Great Depression—Warner Bros. leased the Brunswick record operation to Consolidated Film Industries, the parent company of the American Record Corporation (ARC), in December 1931. In 1932, the UK branch of Brunswick was acquired by British Decca. Between early 1932 and 1939, Brunswick was ARC's flagship label, selling for 75 cents, while all of the other ARC labels were selling for 35 cents. Best selling artists during that time were Bing Crosby, the Boswell Sisters, the Mills Brothers, Duke Ellington, Cab Calloway, Abe Lyman, Casa Loma Orchestra, Leo Reisman, Ben Bernie, Red Norvo, Teddy Wilson, and Anson Weeks. Many of these artists moved over to Decca in late 1934, causing Brunswick to reissue popular records by these artists on the ARC dime store labels as a means to compete with Decca's 35 cent price. During much of 1932, Brunswick/ARC used a different microphone setup in their New York studios which made records from 1932 sound very constricted with little bass. By the end of 1932, they apparently abandoned this setup and sound quality improved dramatically. Collectors have also long complained that Brunswicks from 1936–1939 showed a drop in sound quality as well as pressing quality, but in fact, those records had a wider groove than the earlier Brunswicks. In 1939, the American Record Corp. was bought by the Columbia Broadcasting System for $750,000, which discontinued the Brunswick label in 1940 in favor of reviving the Columbia label (as well as reviving the OKeh label replacing Vocalion). This, along with the lower than agreed-upon sales/production numbers, violated the Warner lease agreement, resulting in the Brunswick trademark reverting to Warner. In 1941, Warner sold the Brunswick and Vocalion labels to American Decca (which Warner had a financial interest in), with all masters recorded prior to December 1931. Rights to recordings from late December 1931 on were retained by CBS/Columbia. In 1943, Decca revived the Brunswick label, mostly for reissues of recordings from earlier decades, particularly Bing Crosby's early hits of 1931 and jazz items from the 1920s. Since then, Decca and its successors have had ownership of the historic Brunswick Records archive from this time period. After World War II, American Decca releases were issued in the United Kingdom on the Brunswick label until 1968 when the MCA Records label was introduced in the UK. During the war, British Decca sold its American branch. By 1952, Brunswick was put under the management of Decca's Coral Records subsidiary. That same year, Brunswick resumed releasing new material, initially as rhythm and blues specialty label, adding pop music in 1957. Later in the 1950s, American Decca made Brunswick its leading rock and roll label, featuring artists such as Buddy Holly & the Crickets. Hit records by Buddy Holly were released on the co-owned Coral Records. In 1957, Brunswick became a subsidiary label to Coral. Starting in the latter part of the 1950s and continuing well into the 1970s, the label recorded mainly R&B/soul acts, such as the label's leading artist in the late 50s and early/mid 1960s, Jackie Wilson, and later on, the Chi-Lites. Jackie Wilson's manager, Nat Tarnopol, joined the label in 1957 as head of A&R. Brunswick became a separate company and a unit of Decca in 1960 with Tarnopol serving as executive vice-president. He acquired a 50% interest in Brunswick from Decca in 1964 and then the rest of Brunswick from Decca in 1969 to settle disputes with Decca management. During the 1950s, the artists on Brunswick and Coral were interchangeable. This single by Buddy Holly and the Crickets, who were signed to Coral, was released on Brunswick. Many of the recordings which established Brunswick as a major force in R&B and soul music in the mid-1960s and into the 1970s were supervised by producer Carl Davis in Chicago. He joined the label after helping to revive Jackie Wilson's recording career with his production on Wilson's 1966 hit, "Whispers". Wilson and Davis collaborated the following year for one of the label's biggest selling singles, "Higher And Higher", which sold over two million copies (No. 1 R&B, No. 5 pop). The Chi-Lites recorded two No. 1 R&B hits in the 1970s for Brunswick, "Have You Seen Her" and "Oh Girl", both co-written and co-produced by lead singer, Eugene Record. "Oh Girl" also topped the Billboard Hot 100 pop chart. Davis formed a sister label, Dakar Records, in 1969, with Tyrone Davis (no relation) becoming its main artist and a major-selling R&B act. Dakar was first distributed by Atlantic Records for two years, but moved under Brunswick distribution from January 1972, after the company became independent from Decca. Brunswick and Dakar artists included the Chi-Lites, Tyrone Davis, Jackie Wilson, Barbara Acklin, Young-Holt Unlimited, Gene Chandler, the Artistics, Otis Leavill, the Lost Generation, Walter Jackson, Erma Franklin, Linda Hopkins, Hamilton Bohannon, Lavern Baker, Sunni Nash and Little Richard. Main producers for the labels, along with Davis, were Eugene Record, Willie Henderson and later, Leo Graham, while staff arrangers during the Chicago years included Sonny Sanders, Gerald Sims, Tom Washington, Quinton Joseph and Willie Henderson. The Chi-Lites' "Oh Girl" was the label's only release from post-1957 to reach the top of the Billboard Hot 100 pop chart, but Brunswick and Dakar managed to top the R&B chart a total of 10 times during the same period, six by Jackie Wilson and two each by Tyrone Davis and the Chi-Lites. Legal problems caused Brunswick to become dormant after 1982 in which Tarnopol licensed Brunswick recordings from 1957 onwards to the special products unit of Columbia Records. Brunswick had its last chart hits in 1982. Although Brunswick was eventually cleared of the charges, the situation, which had resulted in court action, left both the label and Tarnopol in financial difficulties. By then, Carl Davis and most of the artists had left the company. Tarnopol blamed his legal problems on a personal vendetta led by Lew Wasserman, the head of Decca's parent corporation, MCA Inc. Tarnopol died in 1987 at age 56. The Tarnopol family only claims ownership of Brunswick recordings since Tarnopol joined Brunswick in 1957. Decca's parent company, Universal Music controls the Decca-era pre-Tarnopol Brunswick recordings (excluding the late 1931–1939 era, which is still controlled by Columbia Records' parent, Sony Music Entertainment). The Decca-era Brunswick jazz catalogue is managed by the Verve Music Group (which is also part of Universal). 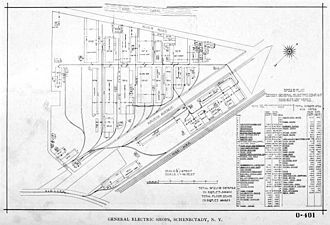 The official Brunswick Records web site has a detailed history of the Tarnopol-era Brunswick Records. The label was revived in 1995 by Nat's children. and many of the Chicago soul recordings have been re-issued in recent years. Brunswick's catalog is distributed by Entertainment One, which was formerly known as E1 Entertainment. ^ Laird, Ross (2001). Brunswick Records - A Discography of Recordings, 1916-1931 vol. 1: New York Sessions 1916-1926. Westport, CT: Greenwood Press. p. 49. ISBN 0-313-31866-2. ^ ''The Billboard'', 29 May 1943, p.95. Books.google.com. 1943-05-29. Retrieved 2014-06-29. ^ ''The Billboard'', 23 August 1947, p.38. Books.google.com. 1947-08-23. Retrieved 2014-06-29. ^ ''The Billboard'', 13 December 1952, p.27, col.5. Books.google.com. 1952-12-13. Retrieved 2014-06-29. ^ Billboard - Google Books. Books.google.com. 1957-03-30. Retrieved 2014-04-04. ^ Billboard - Google Books. Books.google.com. 1957-03-09. Retrieved 2014-04-04. ^ ''The Billboard'', 26 September 1960, p.6, col.6. Books.google.com. 1960-09-26. Retrieved 2014-06-29. ^ "The soul of the 60s and 70s". Brunswick Records. Archived from the original on 2013-03-07. Retrieved 2014-04-04. ^ McDougal, Denis (2001). The Last Mogul: Lew Wasserman, MCA, and the Hidden History of Hollywood. Da Capo Press. p. 439. ISBN 9780306810503. ^ "The soul of the 60s and 70s". Brunswick Records. Archived from the original on 2013-01-07. Retrieved 2014-04-04. ^ "Verve Music Group". List-company.com. Retrieved 2014-04-04. Brunswick Records: From Brunswick to Warner Bros., Decca, et al. "I'm Gonna Love You Too"
It is one of the leading American orchestras popularly referred to as the Big Five. The Philharmonics home is David Geffen Hall, known as Avery Fisher Hall until September 2015, founded in 1842, the orchestra is one of the oldest musical institutions in the United States and the oldest of the Big Five orchestras. Its record-setting 14, 000th concert was given in December 2004, the New York Philharmonic was founded in 1842 by the American conductor Ureli Corelli Hill, with the aid of the Irish composer William Vincent Wallace. The orchestra was called the Philharmonic Society of New York. It was the third Philharmonic on American soil since 1799, and had as its intended purpose, the first concert of the Philharmonic Society took place on December 7,1842 in the Apollo Rooms on lower Broadway before an audience of 600. The concert opened with Beethovens Symphony No, the musicians operated as a cooperative society, deciding by a majority vote such issues as who would become a member, which music would be performed and who among them would conduct. 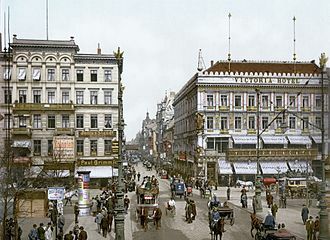 At the end of the season, the players would divide any proceeds among themselves, after only a dozen public performances and barely four years old, the Philharmonic organized a concert to raise funds to build a new music hall. The centerpiece was the American premiere of Beethovens Symphony No,9, to take place at Castle Garden on the southern tip of Manhattan. About 400 instrumental and vocal performers gathered for this premiere, which was conducted by George Loder, the chorals were translated into what would be the first English performance anywhere in the world. However, with the expensive US$2.00 ticket price and a war rally uptown, the audience was kept away. Although judged by some as an odd work with all those singers kept at bay until the end, during the Philharmonics first seven seasons, seven musicians alternated the conducting duties. In addition to Hill, Timm and Étienne, these were William Alpers, George Loder, Louis Wiegers and this changed in 1849 when Theodore Eisfeld was installed as sole conductor for the season. Eisfeld, along with Carl Bergmann, would be the conductor until 1865 and that year Eisfeld returned to Europe, and Bergmann continued to conduct the Society until his death in 1876. Leopold Damrosch, Franz Liszts former concertmaster at Weimar, served as conductor of the Philharmonic for the 1876/77 season, but failing to win support from the Philharmonics public, he left to create the rival Symphony Society of New York in 1878. Upon his death in 1885, his 23-year-old son Walter took over, Carnegie Hall would remain the orchestras home until 1962. The Philharmonic in 1877 was in financial condition, caused by the paltry income from five concerts in the 1876/77 season that brought in an average of only $168 per concert. At first the Philharmonics suggestion offended Thomas because he was unwilling to disband his own orchestra, because of the desperate financial circumstances, the Philharmonic offered Theodore Thomas the conductorship without conditions, and he began conducting the orchestra in the autumn of 1877. Abe Lyman was a popular bandleader from the 1920s to the 1940s. He made recordings, appeared in films and provided the music for radio shows. His name at birth was Abraham Simon and he and his brother, changed their last name to Lyman because they both thought it sounded better. Abe learned to play the drums when he was young, around 1919, he was regularly playing music with two other notable future big band leaders, Henry Halstead and Gus Arnheim, in California. In Los Angeles Mike Lyman opened the Sunset, a night club popular with film stars as Mary Pickford, Norma Talmadge, Charlie Chaplin, Buster Keaton. When Abes nine-piece band first played at the Sunset, it was a success, for an engagement at the Cocoanut Grove in The Ambassador Hotel on April 1,1922, Abe added a violinist and saxophonist. Opening night drew a crowd of 1500 guests in the Cocoanut Grove. Lyman appeared on radio as early as 1922 and his orchestra was broadcast from The Ambassador Hotel by late March on KOG. After the band cut their first record under the local label Nordskog Records, there they made many recordings and were one of Brunswicks leading orchestras through 1935, when Lyman signed to Decca Records. Brunswicks global headquarters is in the northern Chicago suburb of Lake Forest, Illinois. In 2016, it had sales of US$4.5 billion with cash flow of $234 million. 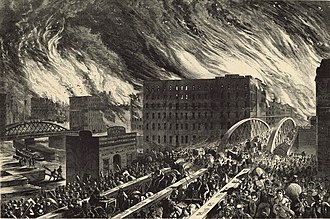 Brunswick was founded by John Moses Brunswick who came to the United States from Switzerland at the age of 15, the J. M. Brunswick Manufacturing Company opened for business on September 15,1845, in Cincinnati, Ohio. Originally J. M. Brunswick billiard tables were a success. It was renamed J. M, in 1874, the Brunswick company merged with competitor Great Western Billiard Manufactory owned by Julius Balke to become the J. M. Brunswick & Balke Company. In 1884, the formed the Brunswick-Balke-Collender Company with capital of $1.5 million. The company expanded into making a number of other products, large ornate neo-classical style bars for saloons were a popular product. Bowling balls and equipment led a line of sporting equipment. It popularized bowling balls of manufactured materials, vulcanized rubber at first, in the early 20th century, Brunswick expanded the product line to include such diverse products as toilet seats, automobile tires, and phonographs. Noah Nicholas Beery was an American actor who appeared in films from 1913 to 1945. 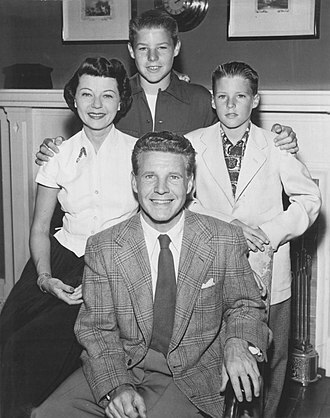 He was the brother of Academy Award-winning actor Wallace Beery. Noah Beery was born on a farm in Clay County, Missouri not far from Smithville, the middle son of Noah Webster Beery and Frances Margaret Beery, he and his brothers William C. Beery and Wallace Beery became Hollywood actors, the Beery family left the farm in the 1890s and moved to nearby Kansas City, Missouri where the father was employed as a police officer. While still a young boy Beery got his first exposure to theatre, possessed of a deep, rich voice even in his early teens, several of the actors at the Gillis Theater encouraged Beery to take singing lessons and consider a career as a performer. 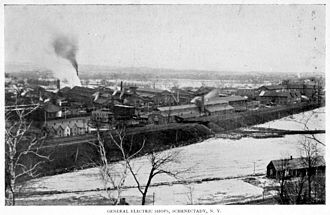 A summer of singing at Kansas Citys Electric Park amusement park led to Beery leaving for New York City while just sixteen years old, Noah Beery found work in vaudeville and in the chorus of musical comedies during his early years in New York. Soon though he would turn his attention to acting in melodramas of the period, after a dozen years on the stage, he joined his brother Wallace in Hollywood in 1915 to make motion pictures. He became a character actor, adept at playing the villain. One of his most memorable characterizations was as Sergeant Gonzales in The Mark of Zorro opposite Douglas Fairbanks, the tagline on the poster for 1923s Stormswept proclaimed Wallace and Noah Beery, The Two Greatest Character Actors on the American Screen. Beery acted through the silent film era, and successfully made the transition to talkies and he appeared in lavish early Technicolor musicals, such as The Show of Shows, the widescreen musical Song of the Flame, Bright Lights, Under a Texas Moon and Golden Dawn. 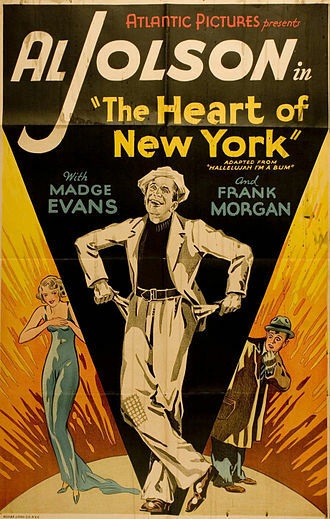 He reached his peak in popularity in 1930, even recording a record for Brunswick Records with songs from two of his films. 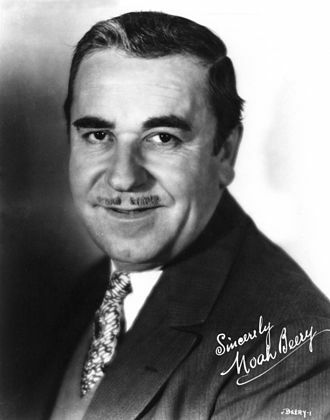 At the height of his career, Noah Beery began billing himself as Noah Beery Sr. in anticipation of his sons presence in films, after his death, his son dropped the Junior and became simply Noah Beery. Noah Beery Sr. appeared in nearly 200 films during his career, Noah Beery Sr. married fellow actor Marguerite Walker Lindsey in 1910. Popular music is music with wide appeal that is typically distributed to large audiences through the music industry. These forms and styles can be enjoyed and performed by people with little or no musical training and it stands in contrast to both art music and traditional or folk music. Art music was historically disseminated through the performances of music, although since the beginning of the recording industry. 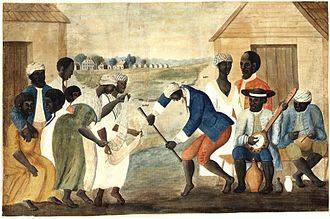 Traditional music forms such as blues songs or hymns were passed along orally, or to smaller. The original application of the term is to music of the 1880s Tin Pan Alley period in the United States, although popular music sometimes is known as pop music, the two terms are not interchangeable. Popular music songs and pieces typically have easily singable melodies, in the 2000s, with songs and pieces available as digital sound files, it has become easier for music to spread from one country or region to another. Some popular music forms have become global, while others have an appeal within the culture of their origin. Through the mixture of genres, new popular music forms are created to reflect the ideals of a global culture. The examples of Africa and the Middle East show how Western pop music styles can blend with local traditions to create new hybrid styles. Sales of recordings or sheet music are one measure and Manuel note that this definition has problems because multiple listens or plays of the same song or piece are not counted. Manuel states that one criticism of music is that it is produced by large media conglomerates and passively consumed by the public. He claims that the listeners in the scenario would not have been able to make the choice of their favorite music, understandings of popular music have changed with time. A societys popular music reflects the ideals that are prevalent at the time it is performed or published, david Riesman states that the youth audiences of popular music fit into either a majority group or a subculture. The majority group listens to the commercially produced styles while the subcultures find a minority style to transmit their own values and this allows youth to choose what music they identify with, which gives them power as consumers to control the market of popular music. The name was derived from one of their corporate divisions, the Vocalion Organ Co. The fledgling label first issued single-sided, vertical-cut disc records but soon switched to double-sided and then, in 1920, aeolian pressed Vocalion discs in a good-quality reddish brown shellac, which set the product apart from the usual black shellac used by other record companies. Advertisements stated that Vocalion Red Records are best or Red Records last longer, Vocalions shellac was no more durable than good-quality black shellac. In 1925 the label was acquired by Brunswick Records, during the 1920s Vocalion began the celebrated 1000 race series. The 15000 series continued, but after the Brunswick takeover, it seems that Vocalion took a seat to the Brunswick label. By 1928–1929, many of the records issued on the Vocalion 15000 series were hot jazz exclusive to Vocalion and are extremely rare, in retrospect, it seems that Brunswick never really had a plan for the Vocalion 15000 series. From 1925 to 1930, Brunswick appeared to use this series as a specialty label for other than general sale. This seems to be an explanation as to why the early 1930s Vocalions are rarer than Brunswick records. In April 1930, Warner Bros. bought Brunswick Records and, for a time, in December 1931 Warner Bros. licensed the entire Brunswick and Vocalion operation to the American Record Corporation. ARC used Brunswick as their flagship 75-cent label and Vocalion as one of their 35-cent labels, the Vocalion race/blues series continued and continued to be popular. Starting in 1933, a number of Brunswick artists were assigned to Vocalions then-new 2500 series, new signings contributed to the growing popularity of the label. Coupled with other short-term signings, including Fletcher Henderson, Phil Harris, Earl Hines, and Isham Jones, starting in 1935, Vocalion started reissuing titles that were still selling from the recently discontinued OKeh label. In 1936 and 1937 Vocalion produced the recordings of the influential blues artist Robert Johnson. From 1935 through 1940, Vocalion was one of the most popular labels for small-group swing, after the short-lived Variety label was discontinued, many titles were reissued on Vocalion, and the label continued to release new recordings made by Master/Variety artists through 1940. Ottorino Respighi was an Italian violinist and musicologist, best known for his three orchestral tone poems Fountains of Rome, Pines of Rome, and Roman Festivals. His musicological interest in 16th-, 17th- and 18th-century music led him to pieces based on the music of these periods. He wrote operas, the most famous being La fiamma. Respighi was born in Bologna, Italy into a musical family and his father, a local piano teacher, taught him to play the piano and violin at an early age. He went on to study the violin and viola with Federico Sarti at the Liceo Musicale in Bologna, composition with Giuseppe Martucci, and historical studies with Luigi Torchi, Respighi passed his exams and received a diploma in the violin in 1899. In 1900, Respighi accepted the role of principal violist in the orchestra of the Russian Imperial Theatre in Saint Petersburg, during his time there, he studied composition for five months with Russian composer Nikolai Rimsky-Korsakov. Respighi returned to Bologna to continue his studies in composition, which earned him a second diploma, until 1908, his principal activity was first violinist in the Mugellini Quintet, a touring quintet founded by composer Bruno Mugellini. Following his departure from the group, Respighi moved to Rome and he spent some time performing in Germany before returning to Italy and turning his attention primarily to composition. In 1919, he married a pupil, singer Elsa Olivieri-Sangiacomo. Although many sources indicate some brief studies with Max Bruch during his time in Germany, during the early twentieth century, Respighi was active as a performer and composer. His compositions began to draw attention and, in 1913, he was appointed as professor of composition at the Conservatorio di Santa Cecilia in Rome, in 1917, his international fame rose following multiple performances of the first of his orchestral tone poems, Fountains of Rome. Subsequent tone poems include Pines of Rome, the Trittico Botticelliano, Vetrate di Chiesa, other notable orchestral works include the Sinfonia Drammatica, in three movements, and the Metamorphoseon Modi XII. From 1923 to 1926, Respighi was the director of the Conservatorio di Santa Cecilia, in 1925, he collaborated with Sebastiano Arturo Luciani on an elementary textbook entitled Orpheus. The phonograph is a device invented in 1877 for the mechanical recording and reproduction of sound. In its forms it is called a gramophone. To recreate the sound, the surface is rotated while a playback stylus traces the groove and is therefore vibrated by it. 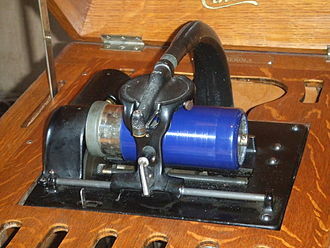 In electric phonographs, the motions of the stylus are converted into an electrical signal by a transducer. 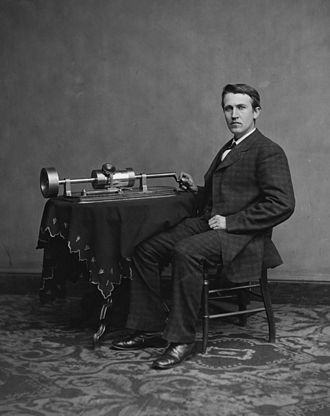 The phonograph was invented in 1877 by Thomas Edison, while other inventors had produced devices that could record sounds, Edisons phonograph was the first to be able to reproduce the recorded sound. His phonograph originally recorded sound onto a sheet wrapped around a rotating cylinder. A stylus responding to sound vibrations produced an up and down or hill-and-dale groove in the foil, in the 1890s, Emile Berliner initiated the transition from phonograph cylinders to flat discs with a spiral groove running from the periphery to near the center. Later improvements through the years included modifications to the turntable and its system, the stylus or needle. The disc phonograph record was the dominant audio recording format throughout most of the 20th century, from the mid-1980s on, phonograph use on a standard record player declined sharply because of the rise of the cassette tape, compact disc and other digital recording formats. Records are still a favorite format for some audiophiles and DJs, vinyl records are still used by some DJs and musicians in their concert performances. Musicians continue to release their recordings on vinyl records, the original recordings of musicians are sometimes re-issued on vinyl. Usage of terminology is not uniform across the English-speaking world, in more modern usage, the playback device is often called a turntable, record player, or record changer. When used in conjunction with a mixer as part of a DJ setup, the term phonograph was derived from the Greek words φωνή and γραφή. The similar related terms gramophone and graphophone have similar root meanings, the roots were already familiar from existing 19th-century words such as photograph and telephone. Joseph Willem Mengelberg was a Dutch conductor, famous for his performances of Mahler and Strauss with the Concertgebouw Orchestra. Mengelberg was the fourth of fifteen children of German-born parents in Utrecht and his father was the well-known Dutch-German sculptor Friedrich Wilhelm Mengelberg. Four years later, in 1895, when he was 24, Mengelberg was appointed conductor of the Concertgebouw Orchestra. In this position, Mengelberg was to premiere a number of masterpieces, Mengelberg founded the long-standing Mahler tradition of the Concertgebouw. Mahler wrote to his wife Alma Mahler that this idea was a stroke of genius. Mahler regularly visited The Netherlands to introduce his work to Dutch audiences, including his First, Mahler edited some of his symphonies while rehearsing them with the Concertgebouw Orchestra, making them sound better for the acoustics of the Concertgebouw. This is perhaps one reason that this hall and its orchestra are renowned for their Mahler tradition. Matthew Passion of Johann Sebastian Bach on Palm Sunday, Mengelberg was music director of the New York Philharmonic Orchestra from 1922 to 1928. One of his first electrical recordings, for Victor, was a two-disc set devoted to A Victory Ball by Ernest Schelling, Mengelberg was described by Fred Goldbeck as the perfect dictator/conductor, a Napoleon of the orchestra, Alan Sanders writes, his treatment of the orchestra was autocratic. In years his behaviour became extreme, and there are stories of abusive verbal exchanges between him and his players at rehearsal. The most controversial aspect of Mengelbergs biography centers on his actions and his biographer Fritz Zwart writes of an interview Mengelberg had given with the Völkische Beobachter, the German Nazi newspaper. 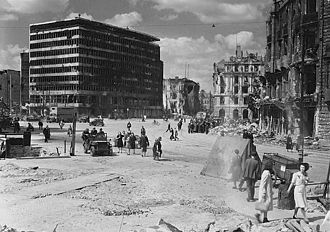 Zwart notes that Mengelberg conducted in Germany and in German-occupied countries throughout the war, explanations have ranged from political naiveté in general, to a general blind spot for criticism of anything German, given his own ancestry. This notwithstanding, he continued to draw a pension from the orchestra until 1949 when cut off by the city council of Amsterdam. The Victor Talking Machine Company was an American flagship record company headquartered in Camden, New Jersey. The company was founded by Eldridge R. Johnson, who had previously made gramophones to play Emile Berliners disc records, Victor Talking Machine Co. was incorporated officially in 1901 shortly before agreeing to allow Columbia Records use of its disc record patent. Victor had acquired the Pan-American rights to use the trademark of the fox terrier Nipper listening to a gramophone when Berliner. Barraud noticed that whenever he played a recorded by his brother. Barrauds original depicts Nipper staring intently into the horn of an Edison-Bell while both sit on a wooden surface. The London branch was managed by an American, William Barry Owen, Barraud paid a visit with a photograph of the painting and asked to borrow a horn. Owen gave Barraud an entire gramophone and asked him to paint it into the picture, the original painting still shows the contours of the Edison-Bell phonograph beneath the paint of the gramophone when viewed in the correct light. 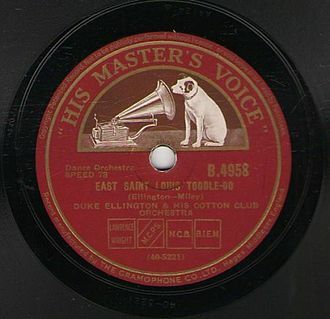 Only 13 originally commissioned His Masters Voice paintings were commissioned by the company, in 1915, the His Masters Voice logo was rendered in immense circular leaded-glass windows in the tower of the Victrola factory building. The tower remains today with replica windows installed during Radio Corporation of Americas ownership of the plant in its years, one of the original windows is located at the Smithsonian museum in Washington, D. C. There are different accounts as to how the Victor name came about, a second account is that Johnson emerged as the Victor from the lengthy and costly patent litigations involving Berliner and Frank Seamans Zonophone. A third story is that Johnsons partner, Leon Douglass, derived the word from his wifes name Victoria, finally, a fourth story is that Johnson took the name from the popular Victor bicycle, which he had admired for its superior engineering. Of these four accounts the first two are the most generally accepted, perhaps coincidentally, the first use of the Victor title on a letterhead, on March 28,1901, was only nine weeks after the death of British Queen Victoria. Company warehouse on State Street, Chicago 1888. Victor IV gramophone. Museo Nazionale Scienza e Tecnologia Leonardo da Vinci, Milan. Strauss villa at Garmisch-Partenkirchen. Built 1906. Architect: Emanuel Seidl. A mated pair of white-naped cranes (Grus vipio) performing a "unison call," which strengthens the pair bond and provides a territorial warning to other cranes. An early Pathé cylinder phonograph from 1898. The design closely mimics that of the Columbia "Eagle".